"If you like Matt Groening's The Simpsons, or the even better Futurama, you will appreciate his latest project Disenchantment"
It could be as easy as that. But that would be cheating. So let us talk about what Disenchantment does expectantly well. To start, Bean is a princess in Dreamland though you would not know it by her hard drinking, party yearning lifestyle. Frequently in trouble and the ire of her father the King she often finds herself in trouble for trying to live a normal life. At the start of the show Bean is about to be married to a prince from another kingdom but she does not want any part of it. A mysterious present reveals Luci, who becomes her own personal demon. Who sent him is as mysterious as their motives. Then, in a far away kingdom of elves, Elfo, desires to be miserable. He is not content with being happy all the time. So he leaves the elf kingdom, makes his way through Dreamland and crashes Bean`s wedding. His arrival creates such an uproar and the three are able to escape for the moment and hold off the wedding. For now. Abbi Jacobson, Nat Faxon and Eric Andre are great as the show`s main characters, Bean, Elfo and Luci respectfully. Groening regulars John DiMaggio, Tress MacNeille, David Herman, Maurice LaMarche and Billy West back this new trio with their veteran vocal skills. The real joy for this reviewer was hearing British comedic contemporaries Matt Berry and Noel Fielding chime in. The musical score and the obviously infectious, catchy theme song are very charming to listen to. The music was created by Devo great and score legend Mark Mothersbaugh. The theme song to Disenchantment has this catchy oompa vibe to it and the medieval score just goes to show how marvellously diverse Mothersbaugh`s musical talents are. The Groening style of acerbic wit, absurdist and caustic humor is always terrific. 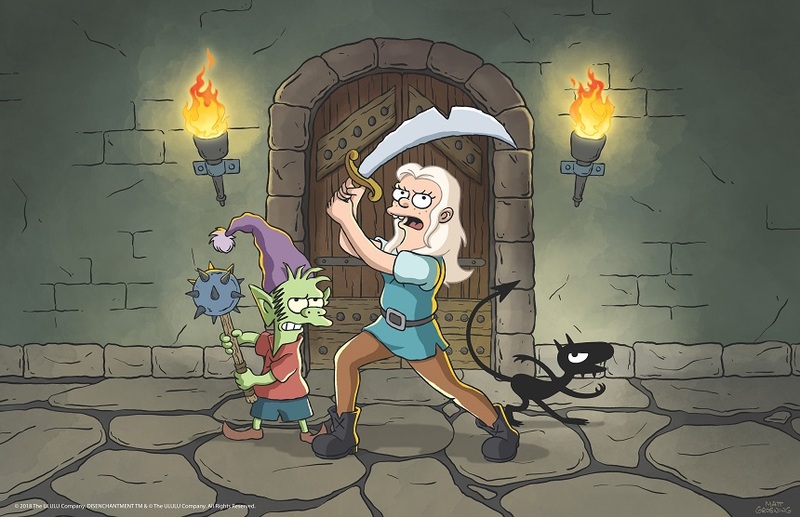 Disenchantment has no shortage of laugh out loud moments in each episode, a credit to the story writers and staff writers on the show. Disenchantment has Groening's recognizable character design too. There are even a couple nods in there to his long running comic strip Life in Hell for the keen eye to spot. I love that the backgrounds are 'painted'; that instead of blocks of color there are rich textures that make the characters stand out more. In this first season of Disenchantment Bean, Luci and Elfo will face off against party crashing Land Vikings, backwood yokels, the burning light of the dawn after a night of hard drinking and Elfo`s love of big women. Often Luci and Elfo act like the devil and angel on Bean's shoulders; Luci aims to lead her down the dark path while Elfo is the voice of morality. There is a common underlying thread throughout the episodes, some narrative continuity from episode to episode but nothing has come of the subplots yet. However, Disenchantment appears to have the same growing pains that its predecessors did. Both of the previous Groening shows needed time to find their footing and through the first seven episodes it still is not clear what Groening plans to do with his central lead. Hope lies in the past. Just as Disenchantment's predecessors became great shows in their own time so do we hope Disenchantmnent achieves the same. It has all of the trademarks of a quality Groening production. Now we wait for the landmarks. This review is based on the first seven episodes of a ten-episode season. Disenchantment launches globally on Netflix on August 17th.